For this Lemon Ricotta & Eggplant Pizza with Hot Honey Drizzle, I wanted to explore the sweet and savory aspects of the ingredients, and the texture of the pizza, while using classic in-season produce. The result hit the preverbal nail on the head. Elevated, yet simple, this pizza is perfect for both weeknights and weekends. Guys, this pizza looks difficult and all time consuming, but hint: it’s not. However, it tastes like you spent hours slaving away in the kitchen. There are a few more steps than my normal pizza’s, but you won’t be disappointed. I am actually so pumped about this recipe as a local magazine, Charlotte Lately, reached out to me and asked if I would contribute a recipe to their summer issue. Duh. Of course. There’s nothing I love to do more than to develop recipes, photograph them, and share them. I wanted the reader to feel what I feel when I think of summer flavors. To embody summer in a few bites was the ultimate goal. While there were/are so many different directions to go, I think this Lemon Ricotta & Eggplant Pizza with Hot Honey Drizzle delivers. I’m currently obsessed with Lemon, so that was a given. Adding lemon to the ricotta takes it up a notch and adds the punch of acidity it needed to stand up to the hearty eggplant. I wanted the pizza to feel “light” – in mouthfeel, appearance, and taste. Fresh herbs and greens help make that happen. Mint embodies summer with its bright green and refreshing taste while the mushrooms add a meatiness to the pizza without weighing it down. Having the right crust also makes a difference. Time after time we use our go-to, Wewalka. It’s affordable, easily available at most grocers, and saves me time in the kitchen. The Hot Honey presents summer in two ways: actually being hot, ooey-gooey, and spicy with the red pepper flakes. Sweet like honey, hot like summahhh. Andrew mentioned that this looks like a work of abstract art, which I am taking as a compliment. Plus he ate most of the pizza. It’s safe to say he liked it. 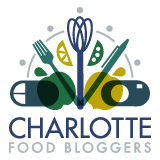 I hope you all get a chance to check Charlotte Lately out and to make this for your next date night in, girls night, or during the weeknight rush. Preheat oven to 425ºF or according to package directions. We love using Wewalka Family Style crust. Using a mandolin, thinly slice the eggplant into ribbons. Be careful! Place the eggplant ribbons evenly on a paper towel. Sprinkle both sides with a hefty amount of salt. Let sit to sweat, about 30 minutes, turning halfway through. After 30 minutes, rinse eggplant and pat dry. Mix the ricotta, lemon zest, lemon juice, salt and pepper in a bowl. Taste to adjust seasonings. Set aside. In a small bowl, mix honey and red pepper flakes together. Set aside. Preferably on top of oven to keep honey warm. Drizzle and spread high quality olive oil onto pizza crust. Season with salt, pepper, and cumin. Spread Lemon Ricotta on dough, leaving about 1/4" dough visible around edges for crust. Layer eggplant, onion, and mushrooms on pizza. Sprinkle goat cheese on top. Bake for 18-20 minutes or according to package instructions. Remove from oven and immediately drizzle the hot honey. Top with arugula and mint, a twist of salt/pepper. Cut and serve with lemon wedge. Any pizza dough will work, even homemade is great! We enjoy using Wewalka crust. A high quality Olive oil is crucial to any meal. We recommend Partanna. We use it on EVERYTHING. 1/4 tsp of red pepper flakes is a guide - if you like things more spicy, add more. If you want to omit it completely, do it. This is your pizza! Personally, I add even more to the pizza after cooking. I like it hot!